Below are excerpts of Ennio Morricone: In His Own Words, a conversation between Morricone and fellow composer (and former protégé) Alessandro De Rosa on life and music. Accompanying these insights are some of the composer’s most influential pieces from cinema. I thought that I might come close to this effect by overlaying two hoarse male voices, one singing “A” the other singing “E” somewhere in between sforzato and falsetto. I went to the recording room, talked about it with the singers, we recorded the voices and added a light reverb and the effect worked. Then I continued this incipit by emulating vocal sounds through the wah-wah effect, which trumpets and trombones obtain by moving the damper back and forth, an effect typical of brass bands in the twenties and thirties. Along with Edda Dell’Orso’s voice, there was also a distorted electric guitar producing a kind of piercing cry. I noted on the score “distorted electric guitar” and two notes: c and b. [Guitarist Bruno Battisti] D’Amario could freely oscillate between the two pitches with quarter-tones, and I added synthesized sounds as well. These little inventions were very rewarding, and gradually I enriched them with more and more electronic instruments. The harmonica is the instrument we see in the hands of one of the protagonists, but it gradually turns into a symbol of revenge. From its tangible presence on screen it leads the mind to grasp what the eye cannot reach, transcending the here and now. Only at that moment does Edda Dell’Orso’s voice enter, followed by a rapid crescendo on the horns leading into the full orchestra, which Leone synced to an upward pan shot of the dolly moving from the window to Jill entering the village. Visually, you move from a detail shot to an establishing shot of the town, and musically from an isolated voice to the full orchestra. Unfortunately I did not have the orchestra at my disposal. I was forced to realize an arrangement with the rhythmic section alone: a piano, a guitar, and a set of drums….She sang beautifully, but I had to handle the mix with great attention in order to create uniformity: her identity and that of the orchestra, which we recorded afterwards, needed to blend as well as possible. I started with [main character Father] Gabriel’s oboe theme: it’s written in a post-Renaissance style, with all the ornamentations that were typical of that period—grace notes, mordents, grouplets, and appoggiaturas. At the same time, I tried to mimic the way the actor moves his fingers on the instrument in the sequence of his first encounter with the Guarani [natives] who surround him above the falls, firmly intentioned to kill him. He liked it so much that he put it directly in the film, without waiting for the final mix, which eventually was released only in Elisa’s official album. Tarantino is famous for his very peculiar way of dealing with music, but that time he went so far as to use a provisional version! In February 2016, The Hateful Eight finally won Morricone a competitive Oscar. Coming at 87, and after 5 previous nominations, it served as a long-awaited feather in the cap of his outstanding career. Yet today, even at the age of 90, the maestro is not entirely finished. His last tour as a conductor will conclude this summer, and there were reports that he would be contributing in some way to Tarantino’s next movie. Luckily, I don’t have to judge myself; history will put all these day-to-day events in perspective….Music is mysterious; it doesn’t offer many answers. Film music, on the other hand, is even more mysterious at times, both because of its bond with images and because of its way of bonding with the audience. Steven Filippi is a Marketing Coordinator for Music, Art, and Film at Oxford University Press. 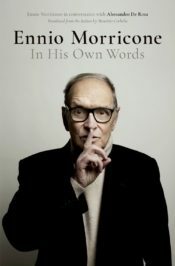 All of the above quotes by Ennio Morricone have been excerpted from Ennio Morricone: In His Own Words, edited by Alessandro De Rosa. Ouvi este SENHOR tocar flauta sobre uma ponte medieval (ponte D. Zameiro) no Caminho Central português para Santiago de Compostela.